"Lion mark" eggs have been declared safe for pregnant women and young children, nearly 30 years after a salmonella scare. Vulnerable groups had been advised not to eat raw, soft boiled or runny eggs. The Food Standards Agency says "Lion Mark" eggs, which include almost all of the eggs produced in the UK, are virtually free of salmonella. The new advice comes after a vaccination programme, and improvements to animal welfare. In 1988, a scare over the presence of salmonella in eggs caused a dramatic collapse in sales of eggs and a series of warnings for vulnerable groups to avoid eating them if they were raw or runny. The then junior Conservative health minister, Edwina Currie, declared: "Most of the egg production in this country, sadly, is now affected with salmonella." Mrs Currie's statement wildly overstated the danger and eventually led to her resignation. But there was a problem with salmonella in eggs and by the 1990s producers started a vaccination programme. The "British Lion Mark", printed on eggs in red ink, was introduced so that eggs could be traced back to the farm of origin and to show best-before dates. 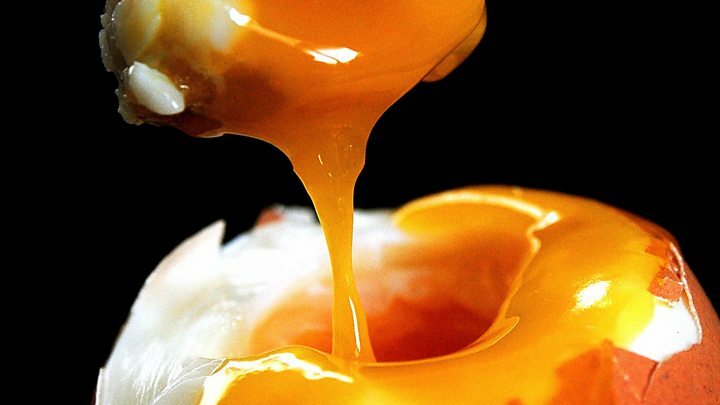 Almost 30 years on from the initial scare, the Food Standards Agency's Heather Hancock, says runny eggs can now be eaten by everyone. Media captionScience now shows the risk from salmonella in eggs is extremely low. "We are now saying if there is a British Lion egg, you're safe to do that. "The risk of salmonella is now so low you needn't worry. "And that's true whether you're a fit healthy adult, or whether you're pregnant or elderly or young. "It's only people on strictly medically supervised diets who need to avoid those eggs." The British appetite for eggs has been growing in recent years. Last year British hens laid 10,372 million eggs, while on average we consume more than 34.5 million eggs every day. And eggs are very good for you, packed full of vitamin D, protein and valuable omega-3 fatty acids. 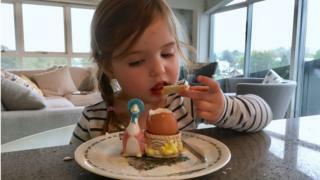 Mother of two Catherine Millington is a big fan, with eggs providing quick, cheap and nutritious meals for her two daughters, who are aged nearly 4 years old and 7 months. "Eggs are brilliant because you can boil them, break them into bits, and the baby can handle them so we can do baby-led weaning with it. "And when you're in a rush, they're dead easy." Just outside Penrith on the edge of the Lake District is The Lakes Free Range Egg Company. Egg farmer David Brass says the introduction of the British Lion standard has made all the difference. "We know from back in the '80s when all the scare started, there was an issue with eggs. "But what the Lion standard does, it is a fully independent, audited code of practice to make sure we have standards on the farm that make sure we can't have any of those disease problems again. "And it has shown time after time, in those intervening years, that it is just a brilliant food safety code." Over the summer, millions of eggs were pulled from supermarket shelves in more than a dozen European countries - including the UK - after it was discovered some had been contaminated with a potentially harmful insecticide at Dutch farms. British eggs were not affected.